The announcement this week that agreement has been reached to pass the first significant piece of national climate policy has been a good news story for the government and generated a modest sense of victory among climate action advocates. But among all the relief, enthusiasm and general disbelief that the Australian parliament could actually agree on something so sensible as a committment to reducing emissions, it is useful to remind ourselves why we are doing this, what the end goal is, and where we are on the journey so far. The point of it all, after all, is to reduce emissions, not just arrest emissions growth - and presumably that would be one of the criteria in evaluating the effectiveness of the policy. Also that those emissions reductions are sustained over time, and ultimately lead to zero emissions - given that, according to the science, the Earth is already too hot, and we need to not only cut emissions to zero, we also need to draw down legacy emissions in the atmosphere if we wish to stabilise the climate. Ahh, the science, you sigh. The pesky scientists! When will they be happy?! Don't they know how difficult it is to negotiate a politically acceptable deal? Well, yes, but in the realm of physics and atmospheric chemistry, Abbott doesn't matter, Monkton doesn't matter, and Andrew Bolt doesn't matter “ atmospheric CO2 just continues to rise, the oceans more acidic and the ice sheets melt, regardless of how politically inconvenient it might be. And what do the scientists say? Well, Melbourne will have the opportunity to find out this week, with visiting climate experts Hans Schnellnhuber and Malte Meinhausen in town from the Potsdam Institute in Germany. The occasion is "Four Degrees', a conference hosted by Melbourne University, so named because that's the lower end of the anticipated rise in global average temperature by the end of this century if we continue on the business as usual path. A climate that is an average of four degrees hotter is completely unprecedented in human history, and if Schellnhuber's advice from 2009 is anything to go on “ humankind will be "toast" at that sort of rise. The Earth has not been four degrees warmer for the last ten million years, and humans were not around then to test their response to it. [i] But the predictions are that we won't go so well “ Professor Kevin Anderson, director of the Tyndall Centre for Climate Change in the UK, believes only around 10 per cent of the planet's population “ around half a billion people “ will survive if global temperatures rise by 4C. Anderson was fairly frank back in 2009: "For humanity it's a matter of life or death," he said. "We will not make all human beings extinct as a few people with the right sort of resources may put themselves in the right parts of the world and survive. But I think it's extremely unlikely that we wouldn't have mass death at 4C. If you have got a population of nine billion by 2050 and you hit 4C, 5C or 6C, you might have half a billion people surviving. "[ii] Meinhausen and others have calculated what volume of greenhouse gas emissions we can pump into the atmosphere between now and 2050 to have a reasonable chance of keeping warming lower than 2°C (above pre-industrial levels). We can only emit 1000 billion tonnes of carbon dioxide (CO2) between the years 2000 and 2050. Trouble is, we've emitted a third of that in just nine years. [iii] If we were to share the total remaining carbon budget equally throughout the world on a per capita basis, Australia would exhaust its budget (as one of the highest per capita emitters in the world) in just seven years. Our commitment in Australia remains (for now) a 5% reduction in 2020, and 80% by 2050. But the science says, if we were to deal with this in an equitable manner, we need to get to zero in less than a decade. Just to give some perspective. So while the carbon price package is welcome, and quite possibly is the best we could get in the current political environment. But let's not kid ourselves that it is bold, generous, or responsive to the science. And whose fault is that? Well, that's just the problem, Australians are all too ready to point the finger elsewhere (at the government, at business, or anywhere - else) and say "they" failed; "they" should have done something else; "they" should have shown some leadership. All that might be true, but parliamentarians will only respond when their constituents demand something of them, and so far, most people in Australia are content to bury their heads in the sand, and pretend it's not happening, or simply distract themselves by wishing the growth economy back to health, as if continuous economic growth was possible on the back of the loss of natural capital, in the middle of a mass extinction event, when we have gone well into ecological overshoot and are playing pretend that if we use up natural resources faster than they can be replaced that some magical process will make it all right in the end. At its core, climate change is a health issue. Around 300,000 people are dying each year from climate change. [iv] Around five million more will die in the coming decade if we fail to act effectively. [v] The bulk of the climate health burden (over 80%) falls on children “ that's right, children, who are powerless to make decisions to increase those emissions that are destroying their health and their future; powerless to say "stop, we choose a different future". [vi] Children, for whom the health burden is not temporary, but for whom early exposure to disease leaves them with lifelong vulnerabilities. Who face higher exposure to pollution per unit of body weight. Who by virtue of having more future years of life face greater threats over a longer period that the rest of us. Who will advocate for them? Despite the declaration in The Lancet in 2009 that "climate change is the biggest threat to global public health of the 21st century", health professionals have so far failed to respond in ways that are proportionate to risk. Public health experts describe a wearied tolerance from other health colleagues when they hold forth on climate change “ as though it were some sort of personal hobby horse whereas others in different parts of the sector are "busy saving lives" and "don't have time for this sort of indulgence". Well, that's regrettable because climate change will eclipse all other threats to health in the coming decades if we don't turn our attention to finding solutions to the biggest threat there is. We must of course continue to act on existing disease burdens, as many will be (are being) exacerbated by climate change. But this threat is global, it's enormous, and until the world seriously turns its attention to dealing with it, climate change will bring unprecedented and dramatic negative impacts on human health. The good news of course is that there is good news. Many strategies to reduce emissions will also bring health gains. This should be also a major source of attention for health professionals “ and a focus of their advocacy for action on climate. Because advocating for action on climate change is possibly the biggest contribution health professionals can make to global public health. The health message is one that, despite the best efforts of some, remains missing from the climate policy story. But the evidence suggests that, when framed as a health issue, climate change is more likely to be perceived in an individual context, and people are more likely to support action for mitigation. We've seen a little bit of political leadership on the issue this week. But we mustn't imagine that's enough. The job is much, much bigger than that, and the voice of all health professionals, as respected leaders in society, would be very welcome in keeping this trajectory on track, to denounce those who misrepresent the science, and to call for action as civil society leaders to send the clear message to the rest of the community, from people who have no vested interest, that climate action is urgent, and ultimately, it's good for health. ">[i] Morton, A. Four degrees of separation, The Age, 9 July 2011. Available at: http://www.theage.com.au/environment/climate-change/four-degrees-of-separation-20110708-1h6yi.html#ixzz1Ri3kgqmC; ">[ii] http://news.scotsman.com/latestnews/Warming-will-39wipe-out-billions39.5867379.jpg; ">[iii] Meinshausen, M. et al. 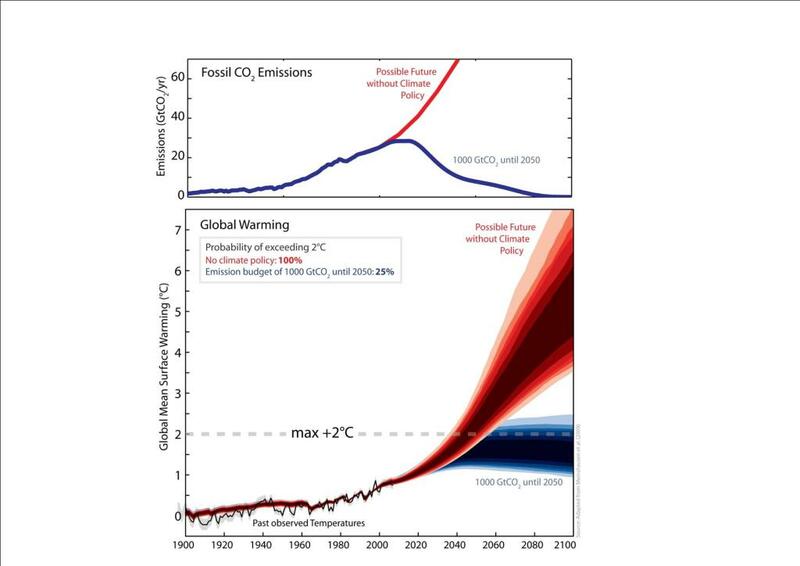 Greenhouse-gas emission targets for limiting global warming to 2 degrees Celsius, Nature, 30 April 2009; ">[iv] Vidal, J. Global warming causes 300,000 deaths a year, guardian.co.uk, 29 May 2009; ">[v] DARA, Climate Vulnerability Monitor 2010: The state of the climate crisis, December 2010; ">[vi] Sheffield, P. and Landrigan, P. Global Climate Change and Children's Health: Threats and Strategies for Prevention, Environmental Health Perspectives, Volume 119 | Number 3 | March 2011. This article first appeared on 11 July 2011 on the online blog Croakey, the Crikey health blog.